The first wine recorded in the journal can be this jammy Napa Valley Claret from Ramey, a 90+ point rated bourdeax blend with a juicy palate, soft round tannins and toasty oak. Or choose fruit-forward and luscious Etude Pinot Noir from Los Carneros, the idyllic valley and iconic viticultural area nestled between Sonoma and Napa. One bottle of Ramey Napa Valley Claret or Etude Pinot Noir. For more information on this wine, please see the Tasting Notes. Your gift is securely wrapped to safeguard the shipping process and arrives presentation-ready in our signature gift crate. A complimentary card with your personal message is included with your gift. Free Embossing! Select up to 20 characters to be embossed on the journal's leather surface. Enter information to be engraved using the personalization option during checkout. Crate Measures 13" x 8". Embossed Leather Wine Log with Red Wine is a hand delivered gift. These gifts are delivered by one of our local design centers located throughout the United States and Canada. Same day delivery is available for most gifts when ordered before the cutoff time. The cutoff time for Embossed Leather Wine Log with Red Wine is 2 PM in the recipient's time zone. Ramey Napa ClaretDeep, rich cassis fruit reveals a sweet, velvety mouthfeel and a full-bodied texture in this classic Napa Valley red. A classic Napa Valley claret, offering intense, smoke-accented aromas of cherry and blackcurrant, with Indian spice and floral notes adding to the complexity. Juicy and precise on the palate, revealing energetic dark fruit flavors and a hint of chewing tobacco. Closes tangy and long, with slow-building tannins and very good focus. 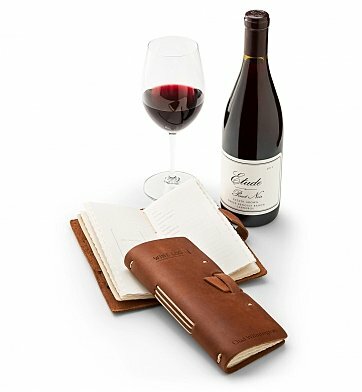 100% genuine leather wine journal with complimentary embossing on cover. Bottle of Pinot Noir or Claret, arranged with the journal in a gift crate.